Has various fractions equal to several fractions with one as the numerator. 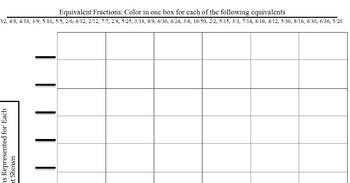 For each fraction, students fill in a blank on the bar graph. Will have students skip counting, multiplying, or dividing to find each equivalent then representing their data in a graph.